How about whipping up an Apple-Peach Glazed Ham from scratch for your party? Better than the one in stores. 1. In a mixing bowl, mix pineapple juice, water, brown sugar, salt, pepper, soy sauce and cinnamon. Set aside. 2. Heat Chef's Classics Hawthorn Sauce pot, add in cooking oil and sear pork leg. Set aside. 3. Using a small sharp knife, create criss cross and insert a whole clove. 4. 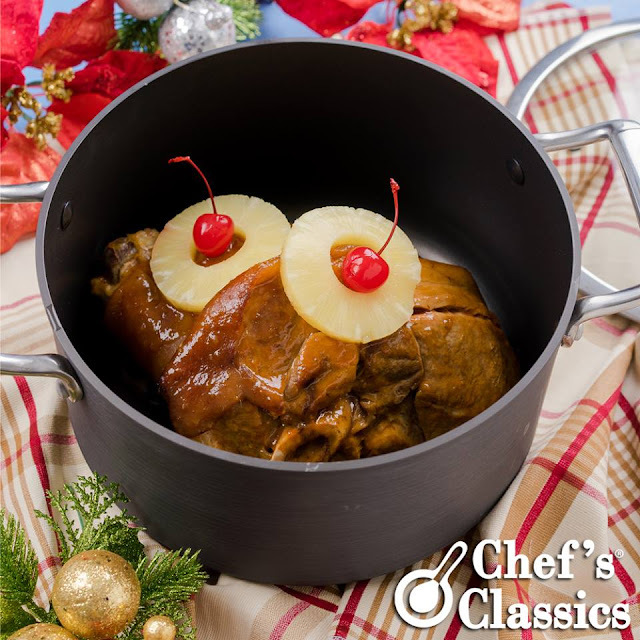 Using the same pot, pour in pineapple juice mixture and add in the pork leg. 5. Add in the diced apple, peach, bay leaf and star anise. 6. Let it simmer for 45 minutes to an hour. 7. Bake for 15 minutes for that nice caramelization. 8. Let pork leg cool down and drain into a rack. 9. Garnish with cherry and pineapple. Serve with the sauce.